One of the things they don’t tell you about college is how much time you have. No, you mostly hear about classes and studying and parties and dorm life and how busy everything is, but the real truth is that you have a lot of free time. And so you have to find something to do, something to distract yourself, or else you’ll just sit there and be a person and think about stuff and no one wants that. My friend Alex and I played a lot of Madden. This was especially true during our sophomore year, when we lived right next to each other and it was so easy to spend one or two or eight hours a day playing Madden. We were evenly matched and so most games were close. There were many many epic moments over the years. We got pretty good (on offense) and the games evolved into 70 point slugfests. But there is one game that is still the most memorable of all. I was playing as the Patriots, and Alex was playing as the Bears, and Alex took a lead into the second half. Just when I was on my way to coming back, Julius Peppers sacked Tom Brady hard. Tom was out for the count. I tried to will him back to his feet, prayed he could come back after one series, but no, he was done. Fractured fibula. And out trotted Brian Hoyer. Hoyer, you may remember, was Brady’s backup for a few years. He only played a handful of times when the Patriots were blowing out their opponent and they wanted to give Brady some rest. But he was always there. And so it was up to him to salvage this game and lead the Patriots to victory. Hoyer had some AWFUL ratings in Madden. Like, any completed pass was a miracle. But you can’t measure heart. Hoyer came in and he was ruthless. He hit his receivers in tight coverage. He ran for a first down. And wouldn’t you believe it, he lead the Patriots down the field for a touchdown and a late-game lead. It was inexplicable, but I was just so proud and EVERYTHING WAS GREAT. And then on the next three drives he threw three interceptions and I lost the game. 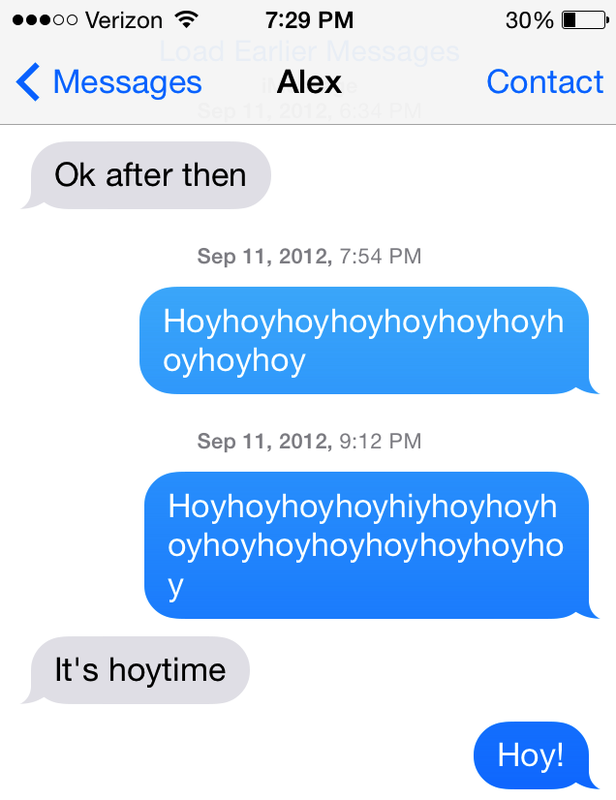 Soon, the word Hoyer meant many different things. You know how you can say a word so many times in a row so that it no longer means anything? * That’s what happened with Hoyer. 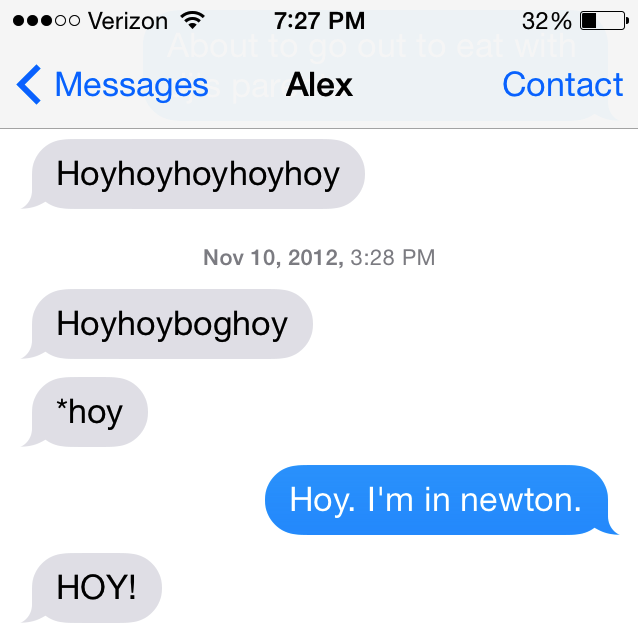 It became a verb (to hoy), a noun (the hoyer), an adverb (hoyly), an adjective (hoyeriffic) and none of it made any sense. The whole Hoyer thing turned into absolute chaos, kinda like the end of that Too Many Cooks video. 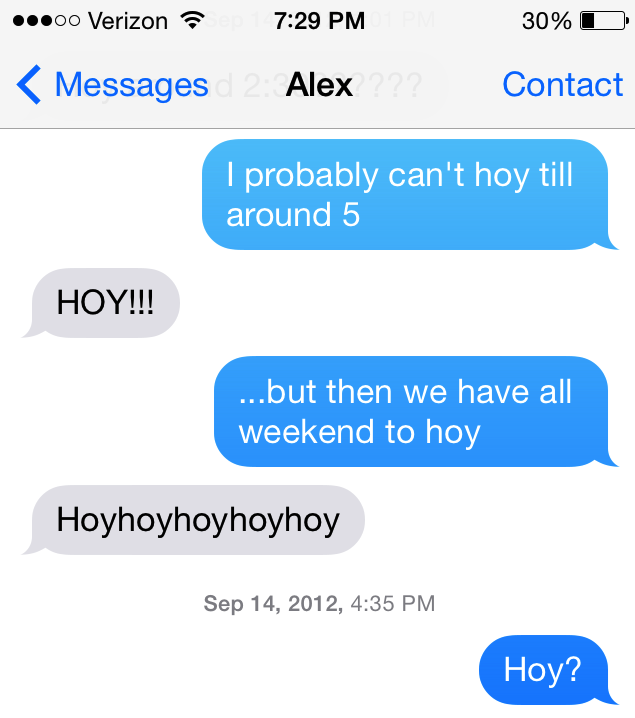 For the past four years, we still communicate with the word Hoyer almost exclusively. We rely on inflection and context to uncover the meaning. Up until recently, the domain of Hoyer was exclusively ours. The real Hoyer continued to backup Brady, and then he was traded to the Arizona Cardinals, and then to the Cleveland Browns, and we expected him remain a backup before quietly retiring. And then, in 2014, Brian Hoyer became relevant. Hoyer competed with first round pick Johnny Manziel for the Browns’ starting job. Hoyer won. And he’s played great. Through nine games, he’s thrown for 2,200 yards, 10 touchdowns, 4 interceptions, and he has a QB rating over 90. The Browns are 6-3, and they are in first place in the AFC North, and Hoyer is a big reason why. This is big news in Cleveland – the Browns haven’t made the playoffs since 2002 and they have been mostly terrible since. After years of standing in the shadows of Tom Brady, Brian Hoyer has become a household name. You know how it feels when you discover a band, and no one else knows about them, and then they catch on and become popular? That’s how this feels. I’ve always felt like Hoyer was mine. I guess you could call me a Brian Hoyer hipster. A hoypster. Still, it is pretty cool to see him flourish in the NFL. It’s about time that the world discovers the greatness that is Brian Hoyer.